As I write these lines, Khamis al-Qadhafi, the most militarily-connected of Muammar al-Qadhafi's sons, is said to be leading his Khamis Brigade to the center of Tripoli in what may very well turn out to be his last stand. 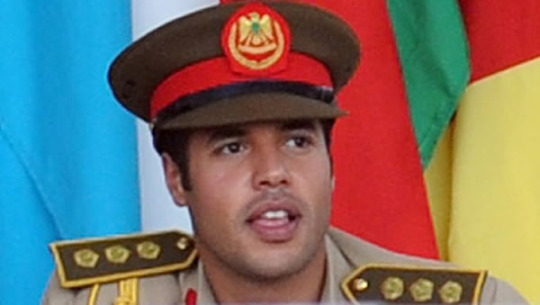 Khamis, the seventh and youngest son of the Brother Leader, operated discreetly at the repressive core of his father's regime for years, the military counterpart to his brother Seif's diplomatic role, tasked with protecting the family. Several months ago, I heard a chilling story about Khamis. It came from an Egyptian acquaintance of mine who has done business in Libya for many years and was well-introduced with regime figures. The Egyptian's company, involved in construction and various state-financed projects, operated in Libya the way most foreigners did. They had regime-connected figures on the payroll, whose role was to smoooth out any problems with the government and make sure hurdles could be removed. It was just the cost of doing business in Libya, where the government could often prove unwilling to honor agreements and everyone needed a little help from a part of the mafia state the Qadhafis ran. The key sponsor the Egyptian company had was a man in his late 60s who had long been a companion of Muammar Qadhafi. "He was a nice guy, a family guy, often very funny," my acquaintance said of him, adding shortly thereafter that his sponsor had been a figure in the Revolutionary Guards' repression of student uprisings in the 1970s, when several students in Benghazi ended up being hanged from lamp-posts. The sponsor, whom I'll call Saeed, used his proximity to Qadhafi to cut through red tape, help get contracts, expedite customs issues and more. He was not a politically powerful person in the Libyan government, but his personal friendship with Qadhafi and record in the regime provided him enough clout to get business done. One day in February, just has the February 17 movement was getting started in Benghazi, Saeed decided to go visit Qadhafi. The official pretext was that his son had recently gotten married, and he wanted to introduce him and his new wife to the Leader in person. The three went to one of Qadhafi's house, received his blessing for the marriage, and stayed to have a talk. Khamis was there too, as other members of his father's entourage. Saeed, because he had known Qadhafi back in the days of the Free Officers, broached the topic of the Arab uprisings and the trouble brewing in Benghazi. He began to give his opinion that, the regional environment being what it is, the regime should be cautious about repressing what were still relatively minor protests in Benghazi. Instead, he argued, it should engage the protestors and be cautious about the potential for the movement to get much bigger, as it did in Tunisia and Egypt so recently. This enraged Khamis. He stood up and shouted at Saeed, accusing him of being a traitor and a weakling, and said his father would never have to give in to the vermin in Benghazi. Saeed respectfully stated he was just giving his advice, in light of what was happening elsewhere in the Arab world — just being cautious. But this only further incensed Khamis (who may have been on some kind of drugs), and the argument kept escalating. Finally, Khamis lost it. He pulled out his sidearm and shot Saeed, killing him instantly. Saeed's son jumped towards his father, and the son's wife wailed. Khamis turned out and emptied his gun into them, killing them both. All of this right in front of his father and his entourage. The incident was covered up, and not reported much, but rumors about it spread in Libya. Saeed's other sons began to make plans to leave the country, and the Egyptian company, having lost its protector, hastened plans already underway to stop their activities. No doubt, within regime circles, that Khamis' murder of Saeed and the newlywed couple sent a chilling warning: show total loyalty to the regime and never doubt my father's choices, or else. The Qadhafis chose to live in denial of reality to the very end. Libya: Can the rebels rule?